I kept a set of the different losing tickets we found that day as a memento and a few weeks later my cousins gave me a different ticket they’d found on another outing. It’s about now a light turned on in my head. I’m not sure how bright you’d say this light was, but I got the idea of collecting these tickets in the same manner people collect stamps. The big benefit of collecting scratchies over lickies, is that you have the hope of winning some money, and at the same time avoid any diseases spread by saliva. Very soon after this collectable decision, I found a thrown away ticket that had not been completely scratched. I was excited at the prospect of being able to play for the $100,000 at no cost. I’d never held a ticket with any unscratched area before as I was too young to legally buy a scratchie, and my church had informed me about gambling being an unproductive past-time. To put it simply, lotteries take advantage of people who are bad at maths. Anyhow, I scratched this ticket, heart thumping, dreaming of how many lollipops I could buy for $100,000. And wouldn’t you know it - nothing. WOW! I now knew I was really onto something. While I knew I could find a winner on a ticket that had been fully scratched, I now also knew there are tickets out there that are unscratched. All I needed to do was find as many tickets as possible, at no cost, and I would not only end up with an impressive collection, but have the hope of finding winning tickets too. After about a decade, and more than 20,000 scrounged tickets later, I stopped collecting as it was taking up too much of my time to check and catalogue all the tickets. I did find tens of winners, as I’d hoped for, but nothing over $25 on a single ticket. 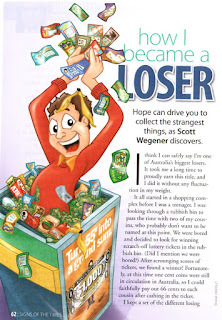 What I did win, from having one of the largest losing ticket collections in the country, is recognition as being one of Australia’s biggest losers. Other lotologists around the word (yes, that’s our official name) actually collect mint tickets. No, not scratch-and-sniff mint flavoured tickets, these are tickets that are bought and never scratched. They do it with the hope that they will be worth more in the future unscratched than what they would have won after scratching them, due to the low odds of winning. They’re probably right, but only their grandchildren will truly know when they scratch all the tickets as they lay them to rest with their grandad in a six-foot deep storage facility. I recently heard that some of these lotologists now have more than a million scratchies. So I guess I’m not as big a loser as I thought I was. One thing I am glad of, is that I didn’t take up collecting lollipop sticks. I could have been Australia’s biggest sucker!